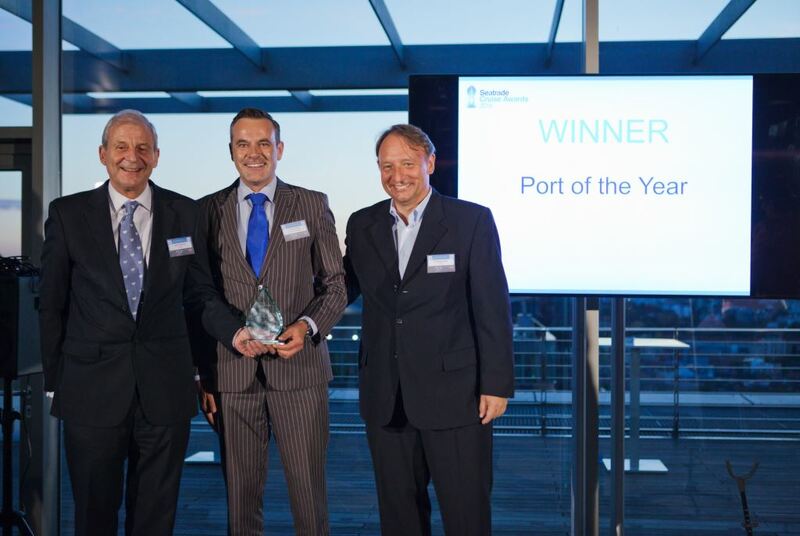 Hamburg, 10 September 2015 – Liverpool (Destination of the Year), Passenger Terminal Amsterdam (Port of the Year), The Image Group (Supplier of the Year), AIDA Cruises and Becker-Marine-Systems (Environmental Initiative Award), and Aloschi Bros – Pope’s Summer Residence & Vatican (Innovative Shorex of the Year Award) were all honoured last night (9 September) as winners in the ninth Seatrade Cruise Awards, principal sponsor Oracle Hospitality, presented at the CLIA Germany Annual Dinner on the occasion of Seatrade Europe 2015, held at Elb-Panorama. Iain Dunderdale, Cruise Development Manager of Cruise Highlands was announced as the winner of the Seatrade Outstanding Achievement Award, for his advocacy in promoting Scotland’s growing cruise business for more than 25 years. Jochen Deerberg, the founder of Deerberg-Systems, which was sold earlier this year to Evac, was the worthy recipient of the Lifetime Achievement Award for Services to Cruising. On several occasions Mr Deerberg initiated and hosted conferences to raise waste management awareness and to exchange knowledge about best practices. In addition, Michael Ungerer, past president of AIDA Cruises, chairman of CLIA Deutschland and chief operations officer, shared services, Carnival Asia, received the coveted Seatrade Cruise Personality of the Year Award, sponsored by V.Ships Leisure. Seatrade Cruise News editor, Mary Bond, said that Mr Ungerer was ‘chosen from nominations received due to the significant role he has played in raising environmental stewardship, climate and environmental protection within his company and the wider cruise sector. It is also fitting that just recently it was announced he is taking up a strategic position in the wider group, moving to Asia for a new chapter in his cruise career. The Rijksmuseum is the museum of the Netherlands. The finest masterpieces and most exciting stories can be found here.